The perfect marriage of authenticity and luxury, Villa Venus sits a stones throw from perfect white sand and crystal clear waters. 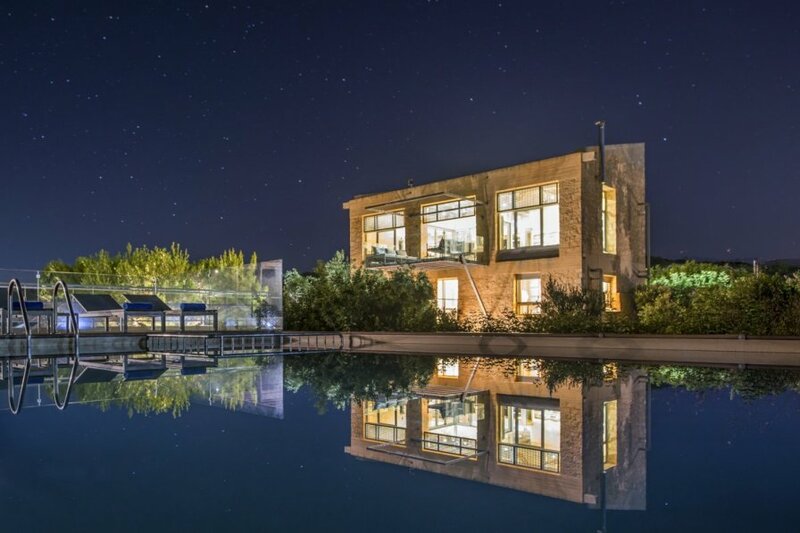 Nestled amongst olive groves in five acres of private land. The perfect marriage of authenticity and luxury, Villa Venus sits a stones throw from perfect white sand and crystal clear waters. Nestled amongst olive groves in five acres of private land, the villa offers stunning views and an outdoor seating area that has to be seen to be believed. A wooden promenade stretches out from double doors on the first floor. Saunter along barefoot as you listen to the sounds of the sea. Spot your private infinity pool down to the left, twinkling lights of the coastline to your right. As you reach the end of the decking you'll find a covered seating area with a spectacular view of the perfect turquoise ocean. The view is truly remarkable, this is the perfect spot to enjoy some drinks before dinner, watch the sunset or curl up with a good holiday read. Set over three floors, the sun-kissed villa benefits from heaps of natural light. On the top floor you'll find the main living space with high wooden ceilings, welcoming wooden floors, huge windows and beautiful stone walls. A huge and comfortable corner sofa looks out over the ocean. At the other end of the room you'll find the dining table and fully equipped kitchen furnished in a rosy pink. Step out the glass double doors onto the balcony to enjoy your meals al fresco. The pale stone walls run through the entire villa, ensuring that each room feels filled with light. On the lower floors, each of the five bedrooms are elegantly minimal and gently lit, with choice furnishings that complement the space. Bathrooms are beautifully designed and of high-spec, allow yourself to relax completely under waterfall showers. In the unlikely event you choose to stay indoors, Villa Venus has loads to do for you and the kids. There's video games, board games, a DVD player, a great music library as well as table football and a ping-pong table in the playroom. Moving outside, there's much to be enjoyed besides the ocean deck - the obvious piece de resistance. Private gardens surround the villa and the swimming pool (which can be heated on request). Lounge the days away on the sunbeds by the pool or take respite from the sun and take a relaxing dip as you gaze out over the sea. The nearest beach is picture perfect and it's just five minutes' walk away. Dip your toes in the sparkling water, enjoy deliciously simple lunches at the cafe or indulge in Cretan delicacies at the beach restaurant. Villa Venus is unique 5-bedroom villa, overlooking Loutraki Bay. With an enormous private 4800m2 grounds, you are almost concealed from the surrounding region's hustle and bustle. The villa is split across 2-storeys, giving guests that little extra discretion. The most striking feature is the Promenade that facilitates unforgettable views, ensuring a romantic evening! Nestled in a fabulous position with gorgeous views overlooking Loutraki Bay, Villa Venus will be a holiday home you won't be forgetting anytime soon! It has an excellent location in walking distance to the beach and amenities, whilst the picturesque town of Chania, with its famous Venetian port, is only a short 20 minutes car journey away. For the outdoorsperson, we recommend a visit to Lake Vouliagmeni. Thermal Spa Vouliagmeni have managed to protect the surrounding countryside, whilst incorporating some neat perks. Experience the Thermal Spring after you've had a Yoga session with the Wellness & Fitness Team in the morning. After you have worked up an apitite, dine at the all-day restaurant whilst the kids roam free in the playground. The geological landscape has been preserved by this business since 1992, so you're in good hands! If you're looking for something a little more cultured, visit one of the many ruins scattered around this region. The Oliver's Team recommends a trip to Moni Osiou Patapiou, once the hermitage of Saint Patapios of Egypt. From here you can experience a striking sunset, which is the ideal end to a busy day. Chania is home to some of the best restaurants on the island, so be prepared to make several journeys in the morning, afternoon and evening to appease your appetite!